[miau] For campy, zoo-inspired fun in a video-slot game, take a spin on Pandamania! Who Makes the Pandamania Slot Machine? The video-betting game experts at NextGen Gaming Software created this machine. What Are this Machine’s Reel and Pay-Line Details? 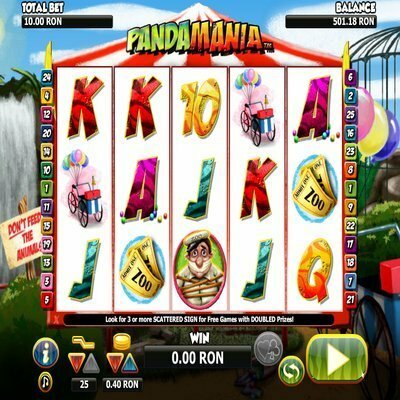 Like most video slot machines, Pandamania features five reels. It also offers the player 25 pay lines that the player can activate with the maximum bet. Adding pay lines to a spin adds possible winning combinations. What Spots Are on this Slot Machine’s Reels? The above list details all of this game’s “regular” spots. Does this Slot Machine Offer Wild Spots and “Scatters”? Pandamania possesses multiple ways for the player to “get wild”. The first is the game’s wild spot. This spot features a maniacal-looking panda. The wild spot can be played as any other spot and create winning combinations. Multiple wild spots on a pay line also give the player a bonus prize. This machine also offers the player “scatter” spots. The scatters in Pandamania appear as makeshift signs emblazoned with the game’s title. These spots are accompanied by a monkey’s shriek on the game’s soundtrack. In Pandamania, scatter spots pay a bonus from any position on the screen. The titular panda character sometimes appears upon a peddle cart, rolls across the screen and changes a regular spot to a wild spot. The game’s makers branded this action the “Panda Escape” bonus. For added fun, NextGen included a “Pick Me” bonus. When a lock symbol appears on each of reels two, three and four, the player can “pick” one and unlock an instant prize. What Is this Machine’s Top Prize? The player can win up to 3,000 betting units on one spin of Pandemania’s reels. How Does a Player Win the Top Prize? This game awards the top prize when any pay line catches five wild spots. Does this Slot Machine Offer a Unique Playing Experience? Pandamania creates a festive experience and includes the added excitement of an escaped panda changing the game at unpredictable times. Is this a Fun Slot Machine? This game produces nearly-maniacal fun!